Overview: THIS IS THE AD-FREE VERSION OF MX PLAYER. MX Player - The best way to enjoy your movies. a) MULTI-CORE DECODING - MX Video Player is the first Android video player that performs multi-core decoding. According to the test results on dual-core devices, it shows up to 70% performance improvement than single-core devices. b) CPU OPTIMIZATION - Provides highly optimized Codecs and Rendering Engines for the processors including ARM® NEON™ and NVIDIA® Tegra™ 2.
c) PINCH ZOOM - Easily zoom in and out by pinching and swiping across screen. d) SUBTITLE SCROLL - Scroll on subtitle text and playback position will be adjusted to match previous or next subtitle timing. e) BETTER SUBTITLE READABILITY - Increased subtitle readability with thicker border and shadow around text. f) ANDROID 4.0 - Fully supports Android 4.0 Ice Cream Sandwich. Sometimes license checking could fail on the first run. It typically happens when current time or time zone settings are incorrect, or Internet connection is unavailable. Please check the time setting and Internet connectivity. If you can't buy from Android Market, please check our home page. We support more payment methods. About "modify battery statistics" permission: MX Video Player displays current battery state while playing video. To do this permission to read battery state is required. However Android does not distinguish between reading battery state permission and writing battery permission. This is why, despite battery state is only being read, permission to write battery state is required. About "System Tools - display system-level alerts" permission: This permissions is required to block HOME key when input blocking is activated on video playback screen. Added support for MIPS CPU having MIPS32 rev.2 instruction set. Fixed some network playback errors. Overview: Must have app for any root user. Make backups, flash ROMs, and own your device. * Flash your recovery to the latest and greatest ClockworkMod recovery. 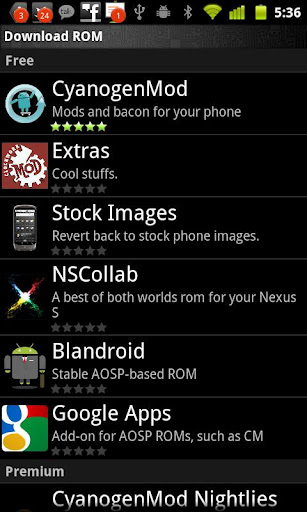 * Manage your ROMs via a handy UI. * Organize and perform backups and restores from within Android! * Install ROMs from your SD card. * Install your favorite ROMs over the air! * Receive notifications for when your ROM is updated! 5.0.0.8 Fix issue with ROM Manager not properly working on Jelly Bean. 5.0.0.7 Fix minor google in app purchase bugs. If your ROM came with ROM Manager you'll have to remove it before installing this. Overview: EXTREMELY powerful tool. Backup ALL apps, Market links, remove bloatware & MORE! ☆Over 5.5 million users, 28+ languages. Added full support for Android 4.1 “Jelly Bean”. [PRO] Added the ability to backup the system browser bookmarks, call log or SMS/MMS to a standard XML file that can either be sent or saved locally. XML files contain your data in clear text, and can be restored on any device/ROM. Hit MENU to access this new feature. [PRO] Added the ability to save exported “.TiBkp” and CSV files locally. Added necessary permissions to access the system browser bookmarks, call log and SMS/MMS. Improved backup speed when making new backups of the same app versions (eg: scheduled backups). Improved GUI Preferences to also display the default system language. Improved .TiBkp & CSV file export to include the date/time in the default filename. Fixed graphical glitches in “App storage overview” screen on Android 3.0+. Fixed “.TiBkp” file import to display proper error messages if no file picker app exists, or when trying to import an incompatible file. Fixed bug with system app update integration on ICS, which caused some apps (eg: Google Earth) to stop working afterwards. Fixed bug when sending a backup: the app name/version mentioned in the e-mail could be incorrect. 3. Patch Titanium Backup Free with "AutoTrue!" .